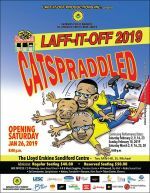 Laff It Off Productions Inc. presents the 34th edition of Laff It Off with the theme Catspraddled. Heavy dialect, and may get raunchy in places. Lowrey Worrell is the musical director and plays the keyboards. Angelo Lascelles is a passionate and versatile actor who has always been determined to take risks. Since his first public performance in 2006, he has had roles in several movies, including “No Country for a White Hero” (2014), “A Caribbean Dream” (2015), “Simba’s Pride” (2015) and “From Bussa to Barrow and Beyond” (2016) and more. His love for theatre came while attending The Lester Vaughan School. He did Theatre Arts when he started Fourth Form and was one of the first students to do so. From there he enrolled in the Barbados Community College’s Theatre Arts programme and has been performing ever since. Angelo, who joined the Laff-it-Off cast for a performance in Boston, loves Theatre Arts and during his short career he has used his background in this field for the purpose of customer service training, public service announcements as well as health campaigns. Janine White is an avid writer of poetry, short stories, plays and dramatic presentations. She has done so many things and been involved in various aspects of the creative arts since her days at The St Michael School. She is a banker by profession but enjoys time on stage as a performer. In 2006 and 2011, she won bronze and silver awards for her entries in NIFCA. 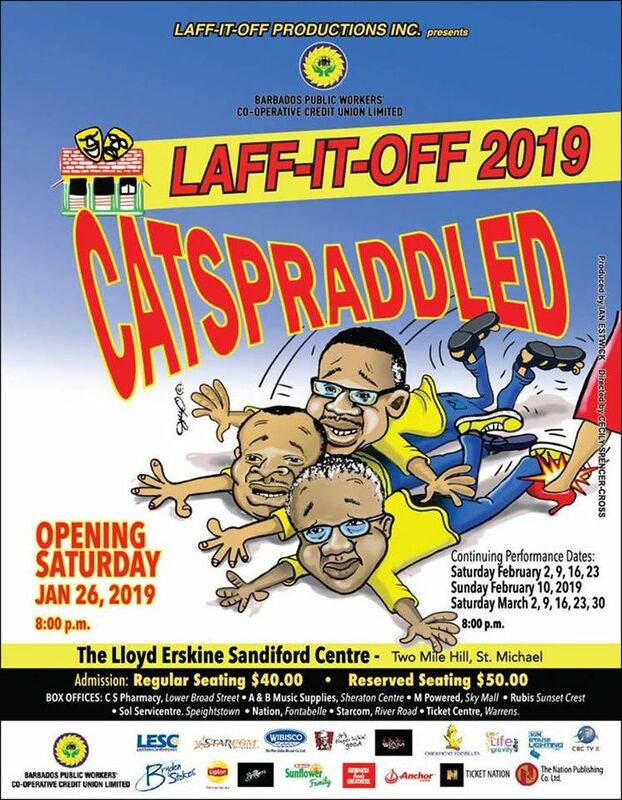 Her hilarious self-penned dramatic piece titled “This Body Is Not Mine” won her the Prime Minister’s Scholarship and a Gold Award at NIFCA 2012. She also won an award for the Most Promising Presentation by an Individual. After winning the Miss Big & Beautiful pageant in 2006, she went on to represent the country in the regional pageant and came second. In 2013, Janine was recognised by Barbados Faces as one of the distinguished women in Barbados. In 2014, she joined the cast of Laff-it-Off full time after travelling with them to the USA the year before. Ishiaka has been a part of the Laff-it-Off family from 2002 bringing loads of laughter to audiences every year. The jovial, energetic, talented and versatile actor and singer has appeared in a number of other productions spanning 18 years. These productions include 'Talk Tent 97', 'Man Over Board' a tribute to Lord Admiral Vernon Watson of the Land Ship, 'Julius Caesar' (Stage one Theatre Productions), 'S.E.X Stories Exchange' (Cross Caribbean Productions), 'Blessed' (UWI), 'Praise Song for Burgie' (Carifesta, 2006) and 'The It So Happen Suite' (Diasporic Arts Productions, 2010). He has also appeared on the Discovery Channel’s 'Locked up Abroad'. Kyle 'kyKycc' Cozier is the youngest member of the cast of Laff-it-Off. You might have seen him on YouTube performing with Carl Alff Padmore in Alffing Around to the Max, perhaps at a Speech Day or other school-based event, or with a Gentle Steps Academy Production but this is his first major “show time performance”. A Psychology major at the Barbados Community College, Kyle doesn’t consider himself a comedian but a performer who loves to see people smiling. His hope is to be a full-time actor and to one day catch a big break landing a role in a Hollywood blockbuster movie. However, he is studying Psychology, so he could earn a living in the event he doesn’t realise that goal but he has found a way to incorporate the two fields. kyKycc is his stage name which he started using when he was the master of ceremonies for the Scotiabank Junior Calypso Monarch. Not only is the newcomer to the Laff-it-Off cast the Creative Director of AYO Creative Ventures, but she is dancer, choreographer, actress, and plus size model. She has attended the Errol Barrow Center for Creative Imagination, where she trained under the Sonia Williams and Amanda Cumberbatch. In 2018, AYO Creative Ventures, entered NIFCA and copped a bronze medal for their choreography Goddess Glow Up as well as the Most Promising Newcomer award. She was able to land a role on the local TV series, Keeping Up With The Joneses as well as work with various young and upcoming directors. The former Parish Ambassador for St. Michael has also danced and choreographed for many local artists and has represented Barbados in St. Lucia on the dance scene in the past. She is a performing arts tutor which includes teaching for the NCF’s Drama In Schools Programme. She has also taught a dance workshop at the Waterloo High School in Trinidad. Teila had a lead role in the 2018 Crop Over Evening of Folk production of What’s Good For The Goose.